An evil entity stalks Lazarus Conlon, Vampyre patriarch, threatening the safety of his wife and his family tribe. But to conquer this enemy, Lazarus must first fight his own demons, including a sacred heritage inherited from fallen angels. Amid this strife, Lazarus learns his only true hope rests within the heart and soul of a mortal tracker--his wife, a woman born to hunt and destroy his breed. Can she help him defeat this evil threatening his very soul or will her tracker heritage demand she kill him? Neomina Delacroix is no stranger to the world of the Vampyre. As appointed heiress of the Tracker Council and the keeper of the Amulet of Christ and the St. John Stake, Neomina's allegiance to her people is sealed in blood. But she doesn't know that her father is not what he seems, and because of him, her true nature is grounded in the very evil threatening her husband. 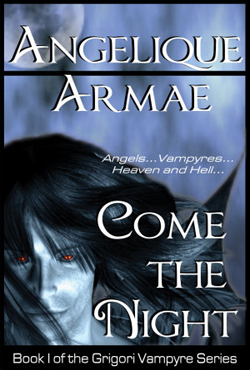 When terror strikes the Conlon Tribe, Neomina is their only hope. But will the dark heritage she inherited from her father save Lazarus and his Tribe, or will evil corrupt her soul and destroy them all? A FICTIONWISE BEST OF THE BEST BOOK -- one of the top five bestselling Dark Fantasy titles of the year.